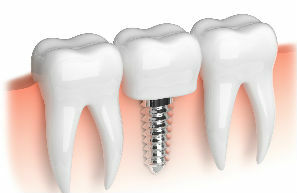 If you have lost or missing teeth you may wish to consider a dental implant from Columbia Prime Dental. We are a full service dental office offering dental implants. Whether your missing tooth is the result of periodontitis, tooth decay or an injury, we can help restore your smile with a beautiful new dental implant that looks and functions just like a real tooth. Significantly stronger than bridges or dentures, a dental implant offers a single and permanent solution to a lost tooth. The implant integrates naturally with your bone. This procedure is relatively simple and is effective in almost all cases, so there's no need to put off restoring that great smile. As with all our dental services, you'll be treated with the nurturing care and professionalism that embodies Columbia Prime Dental's practice. We'll make sure that you're kept comfortable and informed throughout the implant process and will always be available to address any questions or concerns. Don't wait to restore your smile!